FREE BROTHER CARRY BAG WORTH £19.99! 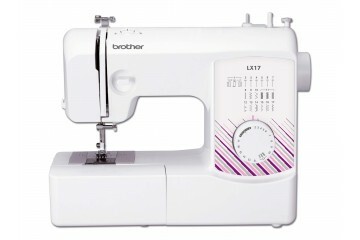 The Brother LX17 sewing machine is the perfect sewing machine for basic alterations and repairs. The LX17 is built with a metal chassis meaning quality has not been compromised. With 17 stitches, selected via the easy to use stitch dial using this sewing machine couldn't be easier! The LX-17 also comes with features such as a top loading drop in bobbin, 4 step buttonhole, LED lighting and the convertible flatbed to freearm. Supplied with this Brother sewing machine is an electronic foot control, which will allow far better control of the sewing speed, great for trickier projects that require precision. The added DVD tutorial will help you to fully utilise this sewing machines features. All of this is packed into a lightweight, portable Brother sewing machine weighing just 7KG.